While we don’t really know much about the Marvel movie slate after Avengers: Endgame, we do at least have Spider-Man: Far From Home to look forward to. Taking Spidey out of New York and sending him on a European vacation sounds like a blast, and with Mysterio playing a big role? And he has his fishbowl helmet? Take my money now. The good folks at LEGO revealed three brand new sets based on the upcoming Spider-Man film, and they look great. They include buildable Mlten Man and Hydro-Man figures, a sweet looking jet, and minifigures of Mysterio and Happy Hogan. A Happy Hogan LEGO figure? Like with the movie, just take my money now. Join Spider-Man and Mysterio in the heat of battle to stop Molten Man melting down the whole city! Molten Man’s dangerous lava is absorbing everything from cars to traffic lights. Escape from this fire monster’s gripping claw and dodge the rapid shooter. Spin spider webs to take down Molten Man then put out all the fires with the firefighter's fire extinguisher! 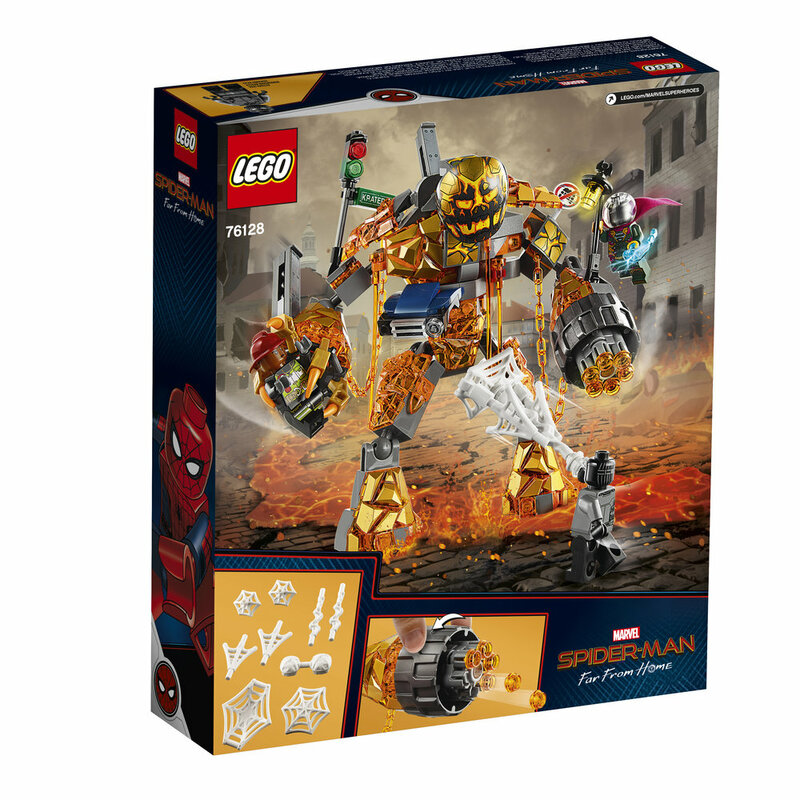 • Molten Man buildable figure features a posable head, arms and legs, gripping claw, 6-stud rapid shooter, buildable ‘melting' objects including half a car, street lamp and traffic light, chain, melting lava stick elements and various attachment points for minifigures. 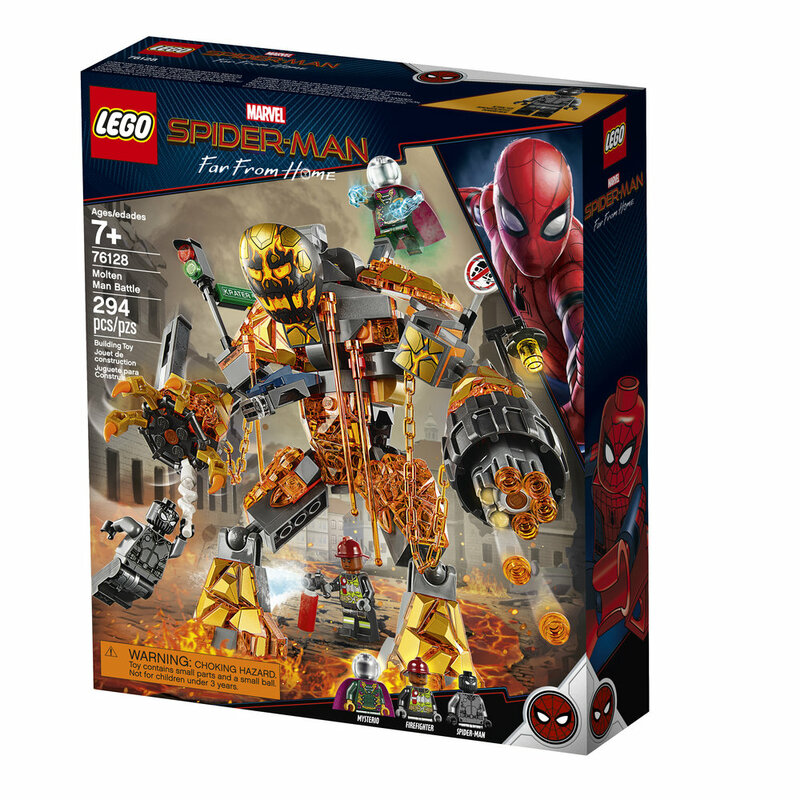 • This Spider-Man playset features minifigure weapons including Spider-Man's web pack, and Mysterio's power energy elements. Take a romantic trip to Venice with Peter Parker and MJ. Enjoy a gondola boat ride then stop at the café for a coffee and a slice of pizza. But watch out—here comes Hydro-Man making huge waves in the canal. Transform into Spider-Man, fire spider webs at the invader and leap across the bridge. Hang on to the wall then explode the bridge. Then fly in to save the day with Mysterio's power energy! • Take apart and build up Hydro-Man's water base to elevate him to different heights. • Recreate thrilling superhero scenes from Marvel's Spider-Man: Far From Home movie with this fun building set for kids. • Venice scene measures over 6” (17cm) high, 9” (25cm) wide and 3” (9cm) deep. • Gondola measures over 1” (3cm) high, 3” (9cm) long and 1” (3cm) wide. • Hydro-Man's buildable water base measures over 2” (7cm) high, 2” (6cm) wide and 2” (6cm) deep. Defend Venice against drone attack with Happy Hogan, Nick Fury, Mysterio, Spider-Man and the super Stark Jet! Adjust the wings and launch into the sky. Control this hi-tech jet airplane from the dual cockpit with Happy Hogan and Nick Fury. Swerve 2 stud-shooting drones and fire back with the jet's own stud shooters. Then release the hatch to drop energy bombs or send Spider-Man swinging into action on his web string! • Stark Jet features a dual minifigure cockpit with pilot seats for Happy Hogan and Nick Fury, control panel stickers, 2 guns, plus a passenger seat for Spider-Man, opening hatch function with attachment point for Spider-Man's spider web string element, rear storage compartment for 3 buildable energy bombs, adjustable wings and 2 stud shooters. • This Marvel building toy also includes the Spider-Man minifigure's spider web string element. • Recreate thrilling superhero scenes from Marvel's Spider-Man: Far From Home movie. All sets will be available this May. Spider-Man: Far From Home will hit theaters on July 5.